Please see below further information about our industrial sliding folding doors in London and Essex. 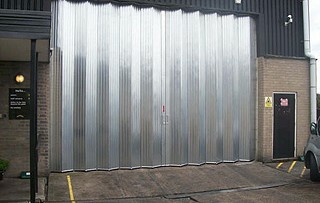 These doors are designed for use within industrial premises to provide the maximum vertical opening for large vehicles such as buses and aircraft whilst also providing a flexible horizontal opening that can be minimised to prevent heat escaping from the premises or cold air entering them. The top track supports the weight of the door and is formed from heavy gauge cold rolled steel strip. 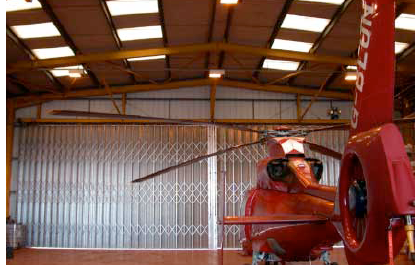 It is fixed to the opening’s lintel with fabricated mild steel brackets where required and is galvanised or painted depending on the door specification and size. Pickets are formed from galvanised cold rolled steel strip and form the main framework for the door on the inside of the building. The top of each picket is supported from the top track with hardened steel grease sealed multi-ball roller. The bottom of each picket runs within the bottom track and gives the door its strength in high winds. The leaves, which are 300mm (12”) wide as standard, are formed from cold rolled galvanised steel strip and are ribbed for aesthetic purpose and extra strength. The gauge varies to suit the size of the door. Smaller 150mm (6”) and 225mm (9”) leaves are also available to suit special applications and smaller openings. The hinge strip is a capped, cold rolled galvanised steel outer channel which allows the leaves to hinge vertically and move with the picket section when the door is operated. The standard bottom track, which is set into the floor, is manufactured from heavy gauge cold rolled steel strip and runs the full width of the door. The leading edge is for accommodating hasp and staples, locks, handles, etc. and stiffens up the front of each door. It is formed into a deep channel from heavy gauge galvanised steel strip. 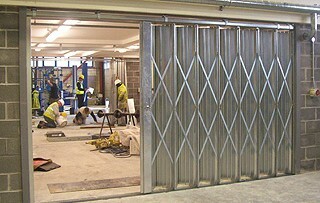 A heavy gauge galvanised steel strip is press baked to the required size and shape and fixed to the doors and doorjambs to give maximum security. Each door has a bow handle inside and out, and is fitted with a heavy-duty hasp and staple, which is normally fixed inside unless otherwise specified. The hasp and staple is to take the customer’s own padlock for security purposes. The operation is by 415 volt 3 phase geared electric motor with a manual disconnection for hand use during emergencies. The starter contains OPEN, STOP and CLOSE button facilities plus a safety thermal cut out switch. The shutter is driven by a continuous chain drive system running at top track level. NB. A three phase isolator with neutral has to be sited by the client one metre from the opening prior to installation. All doors should be serviced regularly especially those electrically operated. Our Service Department will contact you after the installation has been completed and advise you of our Abacus Shutters Limited Maintenance Schemes. Windows, powder coating to leaves only, standard BS/RAL colour range, electrical operation, electrical wiring from isolator, induction loops, safety beams, 150mm and 225mm leaves.